Elizabeth Smart and her new husband Matthew Gilmour incorporated their respective family traditions into their tradition-filled Hawaiian ceremony on Saturday. Elizabeth Smart, 24, who made headlines when she was found 9 months after being kidnapped at knife-point when she was a young teen, looked stunning in a lace boat-necked dress with a full, drop-waist skirt. The groom, Matthew Gilmour, 22, showed off his Scottish heritage with pride as he wore his dead father’s kilt and a boutonnière with blue thistle that had been flown in for the occasion. Their Hawaiian wedding may not seem fitting for the ever-traditional couple, but the location has a real resonance with the bride: it is the place where Elizabeth Smart and her family visited in 2003 shortly after they reunited following her harrowing kidnapping. 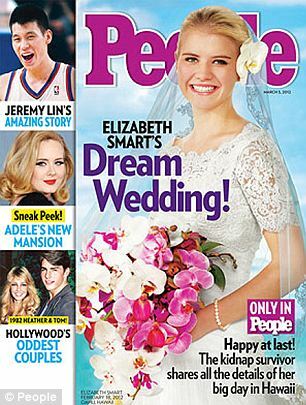 “I guess you could say it was kind of a refuge,” Elizabeth Smart told People magazine. Elizabeth Smart and Matthew Gilmour, who met while on their missionary year in France, married at an 11:30 a.m. ceremony in the LDS Laie Hawaii Temple which was only attended by very close family and friends. In accordance with the religion’s teachings, the actual ceremony itself can only be attended by fellow Mormons who have been given a “temple recommend” sign-off, which essentially says that they are viewed in good standing with the church. Traditionally, Mormon brides are allowed to wear their wedding dress in the temple for the ceremony, though without anything covering their face or head which meant that Elizabeth Smart would have had to take off her beautiful, flowing lace veil. After the ceremony, which took approximately 30-minutes, the celebration continued as the group- which only included 12 guests- went to the Turtle Bay Resort for the wedding luncheon. The elegant lunch highlighted the cuisine of the region, as the group of immediate family and a select few close friends dined on island fish in mango-papaya salsa, Huli Huli chicken, teriyaki steak and roasted Molokai sweet potatoes. Matthew Gilmour and Elizabeth Smart then took a boat ride amid the beautiful Hawaiian surroundings as men in native garb rowed and played the uekelele. That evening, the party continued at a luau where guests were treated to a buffet-style dinner of Lomi Lomi salmon and Kalua pig as well as some instructional hula dancing. While the Hawaiian culture was seen throughout the day, Scottish customs were scattered throughout. One such instance was the toast that Matthew Gilmour gave at the luau, where he began with the traditional “On behalf of my wife and I” introduction, which was met by a roar of cheers and clapping by the group. Throughout the day, Elizabeth Smart and Matthew Gilmour continued wearing their wedding outfits. Elizabeth Smart finally found her perfect dress- after trying “just about every dress in Utah”- off the rack at Kleinfelds bridal salon in New York. She certainly isn’t the first would-be bride to have luck there: the store is the hub of activity on the TLC reality show Say Yes To The Dress. In order to look appropriate on her wedding day, Elizabeth Smart had the dress tulle dress retrofitted with lace sleeves and a demure neckline of scalloped lace. Matthew Gilmour represented his Scottish ancestry – and his father, who died in 2008 after a battle with cancer – by wearing his dad’s kilt. “I wasn’t surprised Elizabeth was ready before Matthew because there is a lot to putting on a kilt,” his uncle Neville Henderson said. The groom’s mother Kay Gilmour made sure to let the other men get in on the action, as she brought ties for Neville Henderson and Elizabeth’s father that matched the same tartan as his kilt. Though their wedding was clearly a start of their new life together, the couple has visited each other’s hometowns and plan to settle in Salt Lake City where Matthew Gilmour will attend university. After their missionary year, the then-friends realized that they were bound for more and began dating. The sparks really flew when Elizabeth Smart visited him in Scotland and they visited historic castles, getting a true sense of his heritage. Matthew Gilmour followed suit by flying to Salt Lake City to spend time with her. While there, he asked for her father’s permission to propose, picked out the unique sapphire ring, and asked her the big question while they were out walking near her house. “The thing that attracted me the most-at the beginning and now- is how confident she is, especially considering everything she has been through,” Matthew Gilmour told People. The wasted no time planning after they were engaged, and while they originally wanted to get married in the summer in Salt Lake City, they switched to the Hawaiian option due to the massive amount of unexpected media attention. Instead, they rushed to get everything together in less than a month after he proposed. “Elizabeth’s desire was for what most women want – to celebrate her nuptials in a private wedding with family and close friends,” said family spokesman Chris Thomas. “After the story broke about her engagement and the media became increasingly invasive, Elizabeth recognized it was going to be impossible to have a traditional wedding devoid of distractions and unusual challenges outside of her control. Though she has become an occasional ABC News contributor, Elizabeth Smart has been wary of unwanted media attention since she first made headlines in 2002 when itinerant street preacher Brian David Mitchell broke into the Smart home and kidnapped her. Brian David Mitchell and his wife Wanda Barzee held her for nine months, during which she was continuously raped and was even married to Mitchell in a bizarre ceremony. Brian David Mitchell was convicted of kidnapping and sexual assault and was sentenced to serve life in prison in May 2011. Wanda Barzee was sentenced to 15 years in a Texas federal prison hospital for her role in the kidnapping of the girl. Now, after testifying at their respective trials and even forgiving Brian David Mitchell of the atrocities he committed against her, Elizabeth Smart is determined to move on with her new life, accompanied by her husband throughout. Elizabeth Smart and Matthew Gilmour were spotted on the Monday after their wedding, buying groceries at a local store while they enjoy their honeymoon at the same hotel that hosted their reception. The National Enquirer quotes an insider as saying that the couple hopes to start a family immediately and aim to have their first baby by their one-year anniversary. who lifts a scottish bride's veil during the ceremony?